Is there a way to monitor the IOP consumption for each individual VM disk using qemu 2.6? Yes, you can use the ‘query-blockstats’ command for that. First let me congratulate you about your blog, plenty of interesting information! I understand the big difference from QEMU 2.4 is the iops-total-max-length parameter, which at the end controls the size of the bucket. What I don’t really understand is that in QEMU 2.4 we already had burst -but no bucket size configuration- do you know how it was behaving in 2.4? I mean, do you know for how long would it allow a burst? without iops-total-max-length bursts were only allowed for one second, so it’s effectively the same as it is now but with iops-total-max-length always set to 1. 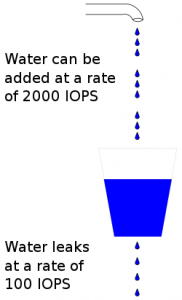 Therefore iops-total=100 and iops-total-max=2000 means that you can perform 2000 I/O operations in one second before being throttled down to 100 IOPS. Due to the way the algorithm works you could also have 1000 operations for two seconds, or ~650 for three seconds, etc., but the hard limit per second is always 2000. Thank you for this! I have just tried it with Qemu 2.8 (jessie-backports with Debian). I have an interesting situation where i can see it working at boot time (ie, if I throttle it down booting the init takes a long time), but once it is in the guest OS the throttling stops working. This is using xen, with full hypervisor mode. when you say it stops working you mean that it I/O runs at full speed, as if no throttling limits were set? There was a bug some months ago that caused the opposite effect (i.e. no I/O at all, see commit 6bf77e1c2dc24da), but that has already been fixed and as far as I’m aware there are no known similar problems in the throttling code in QEMU 2.8. I haven’t tried it with Xen, so I cannot help you with that, but if you manage to reproduce the problem using QEMU alone I would be interested to know. Do you have any pointers to testing with QEMU alone? I am struggling to find examples and current documentation. Your site has been helpful! I’m trying that very command line with the same QEMU version as you (not the backport, though) and it works as expected.